If you're not a fan of Neo Geo fighting games (and why not, dare we ask) this week's new Arcade Archives (ACA) release might be your thing. Hamster is bringing Puzzled to the Switch eShop on 24th August, known in Japan by the much funnier title Joy Joy Kid. At first glance this 1990 release looks like a general Tetris clone, with tetrominoes falling from the top and completed lines disappearing, but the twist here is that you're not playing to complete a set number of lines to clear the level. Trapped at the bottom of each of the 60 levels is a hot air balloon carrying the titular character (or the female counterpart, depending on your choice). Your objective is to clear just the right lines to set it free. This might sound easy, but you will quickly discover that SNK's evil game design geniuses made sure to complicate things as much as possible, with new features and enemies popping up to make you rethink your way to balloon freedom. Plus, in a cruel twist of fate, if you're not careful falling tetrominoes might actually trap the hot air balloon further, making that "Game Over" screen creep on you faster than a straight polyomino falling towards a Tetris chance. 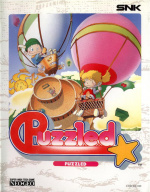 It's another welcome addition to Neo Geo's growing library on the Switch; puzzle fans are certainly getting spoiled for choice on the system and we're not complaining. Will you be rescuing those joyous kids come Thursday? Is it Tetris, right ? This actually looks like fun! May just have to scoop it up. @Anti-Matter Tetris, except the objective isn't to clear the most lines, but to free the balloon trapped under the blocks. Tetris DS spoiled me. Every other iteration of the Tetris formula pales in comparison, in my opinion. I wish I still had my copy. Nintendo steal the "Joy" name... how dear they! Looks like a Tetris clone. Any idea when Zed Blade drops?